By implementing cutting-edge tasting room processes—fundamentally grounded in digital media and emerging technologies—we are confident the new Notaviva will deliver unrivaled creative experiences to wine consumers. Notaviva Vineyards, known to the world as the first winery to pair wine with music, is relocating to Woodland Park, Colorado to commence operations as an urban winery. Believed to be the first transition of its kind, the pivot will allow Notaviva to further develop its brand identity with a new level of focus. The 42.25-acre farm and 4,500 square foot custom timber frame tasting room, production facility and vineyard are listed at $2.195 million. 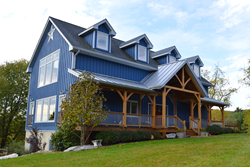 Optimized for farm winery, farm brewery, farm-to-table restaurant, or country estate use, any interested parties may contact Janeen Marconi with Hunt Country Sotheby's International Realty at janeen.marconi(at)huntcountrysir(dot)com to schedule a tour of the property. The winery tasting room will continue to operate throughout the listing period, and any updates on special events and hours of operation prior to a sale will be posted on the website. Notaviva Vineyards and the Mackey family first garnered national attention in 2008 by being featured in the HGTV reality television series “Dream House.” The series followed the construction of the winery tasting room, which doubles as the family home and inspired Stephen’s recently released memoir entitled, “Dream. Build. Believe.” published by Mascot Books. More information on Notaviva Vineyards as well as ongoing scientific research into wine and music pairing can be found on the website at http://www.NotavivaVineyards.com and information on their memoir depicting the founding of the business can be found at http://www.Dream-Build-Believe.com. Mesh Omnimedia, named Loudoun County, Virginia’s 2016 Best Web Design and Development firm, is a full-service creative agency focused on web development, video production, graphic design and strategic marketing services. Mesh commenced operations in Colorado Springs in July 2016 and is currently expanding its team there. More information on Mesh Omnimedia may be found on the website at http://www.MeshOmnimedia.com.